Free lectures explain opera in San Diego! – Cool San Diego Sights! Free lectures explain opera in San Diego! 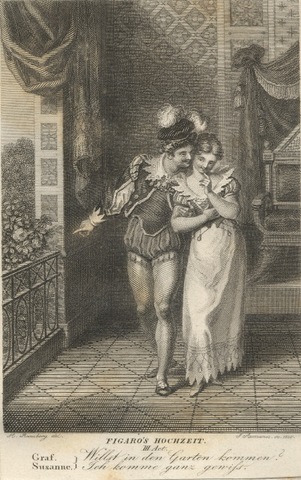 19th century engraving depicting Count Almaviva and Susanna in Act 3 of The Marriage of Figaro. Photo courtesy Wikimedia Commons. By sheer chance I stumbled upon a very cool event this afternoon. I was walking through the San Diego Central Library’s courtyard when I noticed a sign posted by the entrance to the Neil Morgan Auditorium. It announced that a free lecture was about to begin! I hurried in, took a seat, and found myself quickly mesmerized by a talk about the San Diego Opera’s upcoming performance of The Marriage of Figaro! Dr. Ron Shaheen, Adjunct Associate Professor in the Music Department at the University of San Diego, made the fascinating presentation. With the help of photographs, video clips and audio samples, he provided a wide range of information concerning Mozart’s famous opera. Even a complete opera novice like myself could appreciate the beautiful, timeless and amusing qualities of The Marriage of Figaro. Many in the audience chuckled at the antics of its characters. The story, imbued by Mozart with deep emotional richness, turns upon all-too-common human weaknesses. The Marriage of Figaro is a mixture of crazy schemes, sudden surprises, human desire, selfishness, misunderstanding, love, jealousy, even more silliness . . . and concludes with a poignant scene of forgiveness. Intrigued? Visit the San Diego Opera website here. 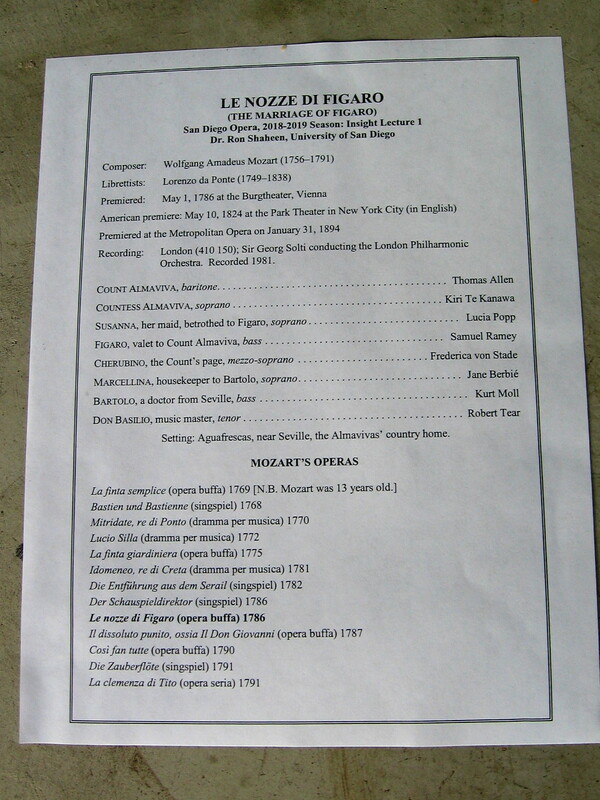 The Marriage of Figaro will be performed in the next couple of weeks. More free lectures in the Opera Insights Series will be coming to the Central Library. You can learn when and where by clicking here. 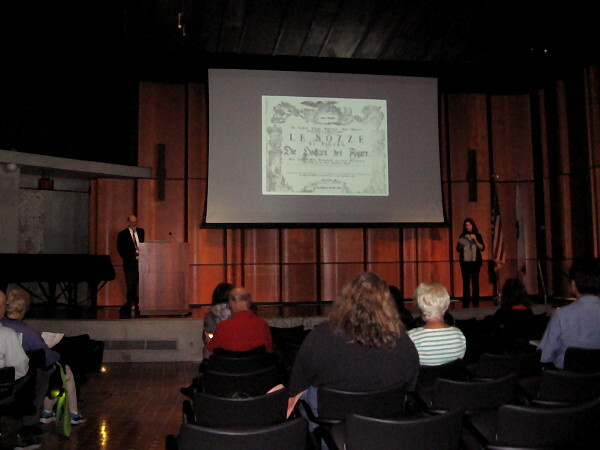 Dr. Ron Shaheen provides an entertaining lecture concerning The Marriage of Figaro during the San Diego Central Library 2018-2019 Opera Insights Series. 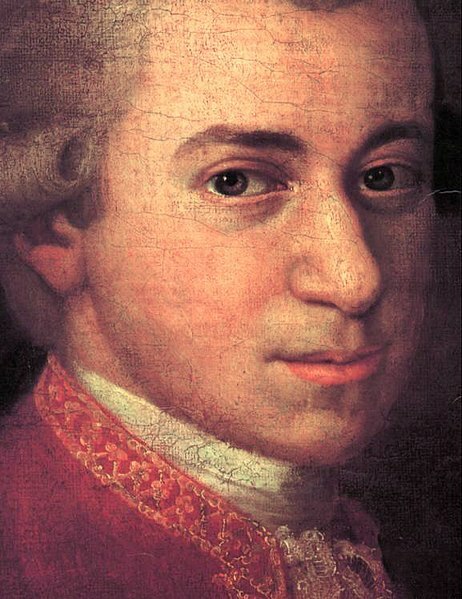 Detail from a portrait of Mozart, by Johann Nepomuk della Croce. Photo courtesy Wikimedia Commons. To read a few stories I’ve written, click Short Stories by Richard. Previous Previous post: Two ways to thank those who served and sacrificed. Next Next post: A golden sunrise above downtown.